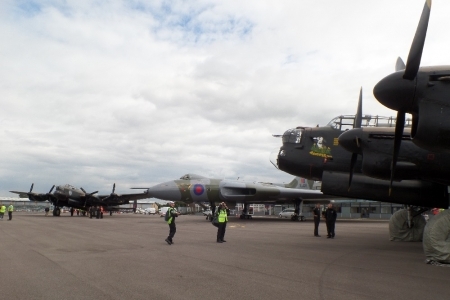 Vulcan XL426 was joined by the RAF's Battle of Britain Memorial Flight Avro Lancaster PA474 and the Canadian Warplane Heritage Museum's Avro Lancaster FM213 at London Southend Airport on a Thursday 21 August 2104. The three Avro aircraft were lined-up on the Southend main apron for what was likely to be in a once in a lifetime photo opportunity. The Canadian Lancaster was carrying-out a UK tour and performed displays and flypasts at a number of air shows and other events, often together with the RAF's Lancaster. The two aircraft had flown into Southend earlier in the day, where they would be based for their appearance at the Clacton Air Show. The chance to photograph the Lancasters with Southend-resident Vulcan XL426 was too good to miss. XL426 was moved from her usual parking space on Soutehnd's eastern perimeter to the airport's main apron on the morning of 21 August prior to the Lancasters' arrival in the early afternoon. After landing, the Lancasters were lined-up either side of the Vulcan for invited the photographers to capture some unique pictures.